When I separate those two words -- "thanks" and "giving" -- I can't help but think of all the animals we love, rescue, and fight for, and the appreciation we owe them. Pet owners are often portrayed as rescuers, with their newly-freed animals seen as rescued. But that exchange of generosity and appreciation goes both ways. We give to animals because what we get in return is immeasurable. We also owe them our thanks because, frankly, we've failed them in many ways, some horrifically. Animals make us feel alive; they make us feel needed. They give us trust and affection without hesitation. They deliver complete loyalty and unconditional love, and respond to us with affection even when we sometimes fail them. Just ask Staff Sgt. Jesse Knott, whose cat Koshka got him through the darkest days of his tour in Afghanistan, especially when a suicide bomber killed two close friends. 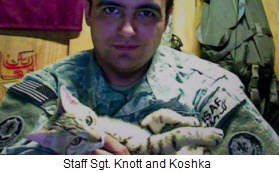 Koshka gave Knott a reason to live. When he returned home to Oregon, Knott arranged for the cat to join him there. Just last week, Koshka was named "Cat of the Year" at our annual ASPCA Humane Awards Luncheon, and rightfully so. 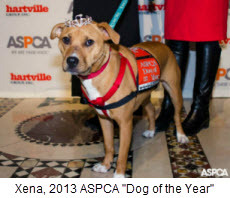 Also consider our "Dog of the Year," a pit bull puppy from Georgia named Xena who was found so abused and neglected that no one expected her to survive. Xena miraculously rebounded and was adopted by the Hickey family, including eight-year-old Jonny, who suffers from Autism. Before Xena came into his life, Jonny rarely communicated with others, and only found comfort in solitary activities. But Jonny forged a miraculous connection with Xena that brought out his personality, and reconnected him to the outside world. The Hickeys could not be more thankful. The Henry Bergh Award, named after our founder, was given to Colorado's National Mill Dog Rescue founder Theresa Strader, who's dedicated her life to saving breeding dogs destined for death in puppy mills. Kept in deplorable conditions, these dogs' sole purpose is to pump out sellable pups; when the mothers can't continue, they're typically killed. Strader's operation has rescued and placed over 8,000 puppy mill survivors since 2007, but it's Strader who sounds thankful. Animals gave her life meaning and purpose. Could there be bigger gifts than these? This Thanksgiving, remember there's no limit on the amount of thanks you can give. And chances are, there's someone in your home -- maybe looking longingly at the platters of hot turkey (or tofurkey) on your table or just warming a corner of your bed -- who deserves all of it and more. Happy Thanksgiving from the ASPCA.